A Hawaiian hurricane is a tropical cyclone that forms in the Pacific Ocean and affects the Hawaiian Islands. Hawaii lies in the central Pacific, where about four or five tropical cyclones appear each year, although as many as fifteen have occurred, such as in the 2015 season; rarely do these storms actually affect Hawaii. Tropical cyclone records were not kept before the 1950s. Earlier windstorms that struck Hawaii were not labeled as hurricanes. September 1843: The earliest report of a tropical cyclone that could have affected Hawaiʻi was made in 1843. On September 23, a German ship recorded a cyclone (known later as the "Cyclone of the Lark") near 17°N and 141°W. No further records are available, but extrapolation of its forward movement predicted that it would make landfall on the southern coast of the Big Island of Hawaiʻi. August 9, 1871: Indigenous newspapers record a major category 3 hurricane causing significant damage across the islands of Hawai'i and Maui. November 1874: In November, a possible tropical cyclone may have dropped over 20 inches (510 mm) of rain on Honolulu, and southerly gales destroyed 23 homes and damaged at least 50. December 1902–03: A low pressure system (known later as "The Froc Cyclone") that took a path similar to that of a tropical cyclone, passed through Kaulakahi Channel in late December 1902. No records of unusual weather were recorded, so the storm was likely still forming as it crossed Hawaiʻi. October 1906: In October a tropical cyclone passed about 60 miles (97 km) south of South Point. Heavy rains were recorded; "the heaviest in years". A little over 12 inches (300 mm) fell in 4½ hours. November 1906: 90 miles (140 km) south of Honolulu on November 3, 1906, a tropical cyclone was recognized. The storm supposedly tracked northward, passing through the Kauai channel. This cyclone must have been abnormally small or very weak, because climatological records show no unusual rainfall, wind, surge, or low pressure. The storm dissipated near British Columbia. August 1925: In August high seas and gusty winds were recorded in Hawaiʻi from a nearby tropical cyclone. August 1938: Again in August a possible tropical cyclone produced heavy wind and rain in the state. August 1950: Hurricane Hiki passed north of the islands, bringing gale winds. 68 mph (110 km/h) winds were recorded in Kauai. Additionally, at total of 52 inches (1321 mm) of rain fell over 4 days in Kauai. One person died from Hiki. July 1957: Hurricane Kanoa, after taking a long journey across the eastern Pacific, became a non-tropical circulation a few miles east of Hawaiʻi. The remnants of Kanoa brought welcomed rain. November 1957: Hurricane Nina was a Category 1 hurricane that formed in November south of Hawaiʻi. Nina moved north and took a sharp turn to the west without actually striking the state. Nina's closest approach to land, which was relatively far off the coast, was only about 120 miles (190 km) southwest of Kauai. Nina caused about $100,000 damage in Kauai and dropped over 20 inches (510 mm) of rain in 14 hours. Nina set a record for the highest wind gust ever recorded in Honolulu: 82 miles per hour (132 km/h). Nina killed four people throughout the islands. August 1958: On August 7, a tropical storm seemed to rapidly appear directly off the coast of Hilo. It moved across the islands, dropping considerable rainfall and causing about $500,000 of damage, before dissipating. August 1959: Hurricane Dot was another powerful August arrival. Dot entered the Central Pacific as a Category 4 hurricane just south of Hawaiʻi. On August 5, Dot seemed to turn more northwest, aiming it directly at Kauai. 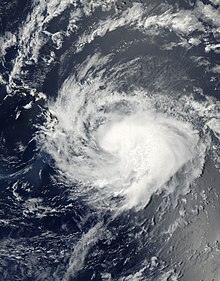 On the 6th, Dot began weakening, and at its landfall in Kauai, Dot was only a Category 1 hurricane. Despite being greatly weakened, the hurricane brought gusts of over 100 miles per hour (160 km/h). In some areas of the island, palm trees snapped in half, suggesting winds were locally over 125 miles per hour (201 km/h). Damages from Dot cost no more than a few million dollars, and rainfall was relatively light; around 4 inches (100 mm). No Dot-related deaths were recorded. September 1963: Tropical Storm Irah crossed the islands as a tropical depression, bringing 36 miles per hour (58 km/h) winds, but caused little damage. August 1966: Hurricane Connie brought heavy rain to Big Island and Maui without making landfall. August 1970: Tropical Storm Maggie passed just south of the Big Island, dropping nearly 10 inches (250 mm) of rain. January 1971: Although not having existed in the Central Pacific as a tropical cyclone, the extratropical low that was Tropical Storm Sarah in the West Pacific passed over Hawaiʻi in mid January, causing high winds and heavy rain. July 1971: Hurricane Denise dissipated before reaching Hawaiʻi, but brought beneficial rain of over one inch to dry farms and sugarcane plantations. Denise's outer winds helped Sheila Scott while she was flying solo around the world and a boat named Winward Passage won the Transpacific Yacht Race. Both were headed to Honolulu. August 1972: Hurricane Diana dissipated a few miles off shore of the Big Island, dropping over 10 inches (250 mm) of rain in some parts. September 1972: Hurricane Fernanda may have caused flash flooding near Waipio as it passed to the northeast. August 1976: Tropical Storm Gwen passed north of Hawaiʻi, dropping 1–2 inches (25–51 mm) of rain across the entire state. July 1978: Hurricane Fico created 15 feet (4.6 m) waves, felled trees and knocked out power across the islands. July 1982: Hurricane Daniel passed through the islands as a tropical depression, causing little if any damage. November 1982: Hurricane Iwa was one of Hawaii's most damaging hurricanes. Although it was only a category 1 storm, it passed just miles west of Kauai, moving at a speed of nearly 50 miles per hour (80 km/h). Severe property damage was inflicted on the island; up to $250 million (a record for that time). 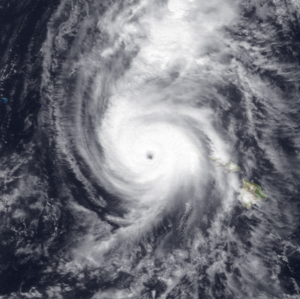 Iwa was the most damaging hurricane to ever hit Hawaiʻi until Hurricane Iniki took over the title 10 years later. July–August 1983: Hurricane Gil passed over northern Hawaiʻi as a tropical storm, causing minor damage. October 1983: Hurricane Raymond took a path similar to Gil's, but as a depression, causing no damage. July 1985: Hurricane Ignacio, although missing the islands, generated surf that measured from 10 to 15 feet (3.0 to 4.6 m) causing damage to coastal roads and structures. Only light rain was reported. July 1986: Waves caused by Hurricane Estelle caused $2 million in damage when they destroyed five houses and damaged several others. Two people on Oʻahu drowned in rough surf. August 1988: Tropical Storm Gilma moved through the island chain as a depression, dropping locally heavy rainfall of up to 4 inches (100 mm) in some places. August 1988: Hurricane Uleki approached the state. Two drownings on Oahu were attributed to rough surf caused by the hurricane. July 1989: Hurricane Dalilia dropped heavy rains over Hawaiʻi, setting a new July record for Honolulu International Airport, 2.33 inches (59 mm) in 24 hours. Rain was heavier elsewhere, with up to 8 inches (200 mm) falling near the North Shore. August 1991: Hurricane Fefa dissipated shortly before landfall. Two people were injured by lightning. Locally strong wind gusts reached 58 miles per hour (93 km/h) at some localities, mainly over Hawaiʻi and Maui. Some heavy downpours occurred, particularly on the Big Island. Localized flash flooding was reported in the Kohala and Hamakua districts. July 1992: Hurricane Georgette brought locally squally winds over the state as a depression. Several large waterspouts were sighted off Hapuna Beach in the South Kohala district. September 1992: Hurricane Iniki caused more damage than any other hurricane to affect Hawaiʻi since records began. It hit the island of Kauai as a Category 4 on September 11. Iniki caused $3.1 billion in damage, mainly to Kauai. It remains the costliest East/Central Pacific hurricane on record. Six died as a result. Iniki brought winds of 140 miles per hour (230 km/h). September 1992: Hurricane Orlene struck Hawaii as a tropical depression causing heavy rainfall, washing out roads, shortly after Iniki ravaged the island. July 1993: Hurricane Eugene dropped valuable rain on the state as it dissipated. Minor power outages and rain made traffic conditions hazardous. One fisherman was reported missing. August 1993: Hurricane Fernanda brought heavy surf of up to 15 feet (4.6 m) on the east facing beaches from the Big Island to Kauai. Wave heights between 15 and 20 feet (4.6 and 6.1 m) was reported on Kauai. Shoreline roads on all islands were damaged and some homes flooded. July 1994: Tropical Storm Daniel dumped 5 inches (130 mm) of rain over the windward slopes of Big Island. Moderate surf of up to 6 feet (1.8 m) affected the east and southeast shorelines on the Big Island. July 1994: Hurricane Emilia damaged trees and foliage while passing south of Hawaiʻi. Surf reached 10 feet (3.0 m) along the Puna and Kau shorelines. July 1994: The remnants of Tropical Storm Fabio brought heavy showers to Big Island and Oahu. Rainfall accumulated to 4 inches (100 mm). August 1994: Tropical Depression One-C passed just south of the islands, causing severe flooding in Hilo. August 1999: Hurricane Dora caused minor wind gusts of up to 58 miles per hour (93 km/h) on the southern part of Big Island as it passed south of Hawaiʻi. August 2000: Hurricane Daniel passed north of the islands, bringing a few thunderstorms but no significant flooding. High surf with waves of up to 10 feet (3.0 m) impacted the eastern side of the island of Hawaiʻi. August 2003: Hurricane Jimena brought up to 10 inches (250 mm) of rain as it passed the Big Island. High surf with heights of up to 15 feet (4.6 m) were reported on the windward sections of Big Island. A gust of 53 miles per hour (85 km/h) was recorded at South Point. August 2004: The remnants of Hurricane Darby passed over the islands and combined with an upper level trough to create unstable moisture, dropping up to 5 inches (130 mm) of rain in a few hours on the Big Island, causing flooding and road closures. Rainfall up to 5 inches (130 mm) was also reported in Oahu. September 2005: An upper level trough which had resulted in the remnants of Hurricane Jova brought unstable conditions to Hawaiʻi, allowing locally heavy rainfall to occur. September 2005: The remnants of Hurricane Kenneth brought locally heavy rainfall, with up to 12 inches (300 mm) falling on the Big Island of Hawaiʻi. Intense rains over Oahu and Kauai caused flash floods on Kaukonahua Stream and the overflow of Lake Wilson at Wahiawa Dam. Flash floods occurred on Hanalei River forcing the closure of Kuhio Highway. August 2009: The remnants of Hurricane Felicia brought light rainfall to the northern islands. August 2014: Hurricane Iselle approached the Island of Hawaiʻi as a Category 1 Hurricane, prompting hurricane warnings for the area before it made landfall in the southeast portion of the island as a moderate tropical storm, bringing heavy rain, flooding and minor structural damage. Overall, Iselle caused $79.2 million (2014 USD) in damage, mainly to the papaya crop. One person was killed indirectly having been swept away by a stream engorged with heavy rain from the storm. July 2017: The remnants of Hurricane Fernanda passed to the north of the islands on July 24, producing thunderstorms and heavy showers in the region. August 2018: Hurricane Hector passed about 200 miles (320 km) south of the Island of Hawaiʻi as a Category 3 hurricane, generating 20 foot high surf along the southern side of the island. At least 90 people had to be rescued off the shores of Oahu due to dangerous swells generated by the cyclone. August 2018: Hurricane Lane slowly approached the islands from the southeast, peaking as a powerful Category 5 hurricane (one of only two recorded within 350 miles of the state), prompting the issuance of hurricane watches and warnings for every island in Hawaii and becoming the first major threat to the state since Hurricane Iniki. Lane weakened significantly as it moved towards the islands, however its outer rainbands caused severe mudslides and flash flooding especially in the Island of Hawaiʻi, where a maximum of 52.02 inches (1,321 mm) of rain was recorded at Mountainview, Hawaii on August 27. In Koloa, a man drowned after jumping in a river to save a dog. The islands of Hawaii, with Kauai as the notable exception, appear to be remarkably immune from direct hurricane hits. The USGS states that "more commonly, near-misses that generate large swell and moderately high winds causing varying degrees of damage are the hallmark of hurricanes passing close to the islands." This has also drawn media attention. One notion is that Hawaii’s volcanic peaks slow down or divert storms. A partial source of this idea may be the long list of hurricanes in the above paragraphs that dissipated into tropical storms or depressions upon approaching the islands. Satellite images of Hurricane Flossie's breakup when approaching Hawaii Island fueled this idea. Another example may be Hurricane Felicia which dropped from Category 4 down to a tropical depression with residual winds predicted at only 35 miles per hour (56 km/h). Tropical Storm Flossie (not to be confused with Hurricane Flossie in 2007) provides still another example. On July 28, 2013, the storm appeared headed for a direct hit to the Big Island, home to Mauna Kea and Mauna Loa. Both mountains rise to elevations in excess of 13,000 feet above sea level, and as Flossie approached the island, its track shifted abruptly overnight and assumed a more northerly alignment, heading instead to the island of Maui on July 29. Wind data in particular supports the USGS assertion that hurricane damage has been low on all islands except for Kauai. Data collected by the Western Regional Climate Center show no hurricane-strength winds on any Hawaii Islands with the exception of Kauai. Despite this data, FEMA classified all of Hawaii as being in a "Wind-Borne Debris Region". ^ a b Businger, Steven; M. P. Nogelmeier; P. W. U. Chinn; T. Schroeder (2018). "Hurricane with a History: Hawaiian Newspapers Illuminate an 1871 Storm". Bull. Amer. Meteor. Soc. 99 (1): 137–47. doi:10.1175/BAMS-D-16-0333.1.